Choose Hubble Space Telescope's next discovery! Whilst the big news may be about fans having the chance to choose Watford FC's kit for next season, internet users also have the chance to choose the next thing that the Hubble telescope will explore! To celebrate the 400th anniversary of Galileo's observations visitors to the Hubble Space Telescope site can vote on what they would like it to focus on next - and also have the chance to win one of 100 pictures of the chosen destination. At http://youdecide.hubblesite.org/ there are 6 options to choose from - Star-Forming Region, Planetary Nebula NGC6072, Planetary Nebula NGC40, Spiral Galaxy, Edge-on Galaxy or Interacting Galaxies. 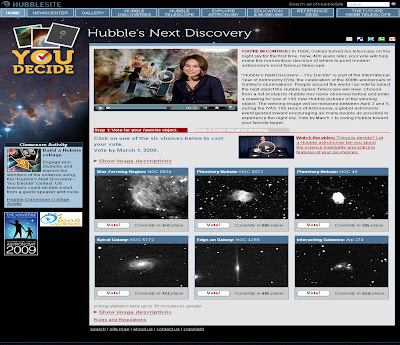 There is also a video of a Hubble astronomer giving information and enticing features of the six available choices. The current leader is the Spiral Galaxy, but as voting runs until the 1st March there is plenty of time for one of the Planetary Nebulas to overtake - another great example of how an organisation can use the internet to open itself up to a wider audience and generate interest outside of a existing (niche) community. Google launch 'Google Sky' - internet users can now explore the Earth AND the Universe!